Music: C. Steggall, Mus. Doc. Source: Joshua Sylvester, A Garland of Christmas Carols, Ancient and Modern (London: John Camden Hotten, 1861), pp. 87-88. 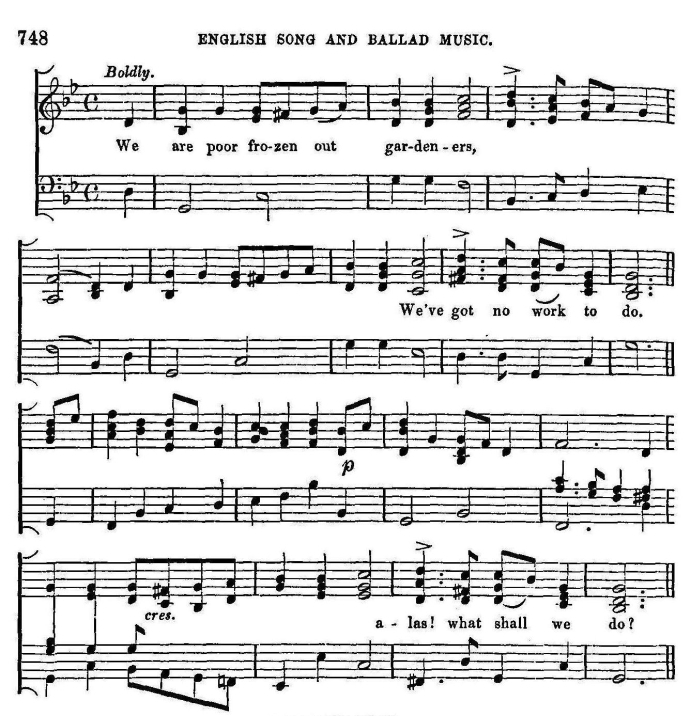 Sheet Music “The Foggy Dew,” Irish Folk-melody, collected by Mrs. C. Milligan Fox, from Richard R. Terry, Old Christmas Carols. Part One. (London: Burns Oates & Washbourne Limited, n.d., ca. 1923), #5, p. 8. 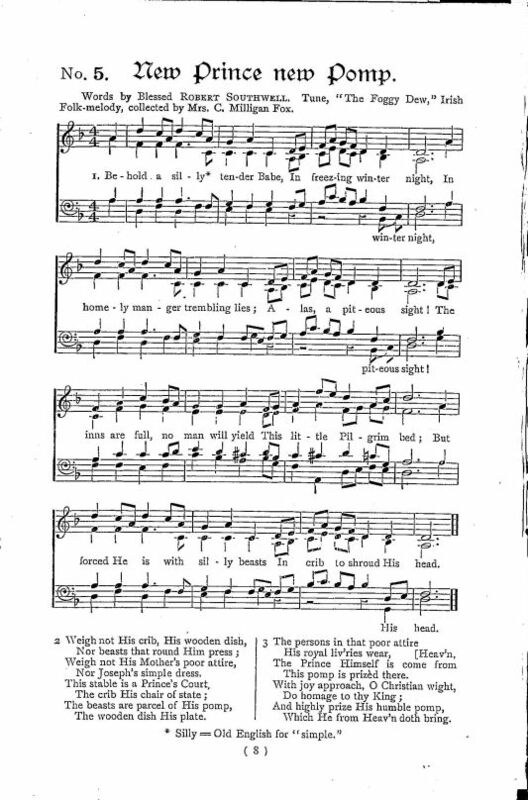 Sheet Music from Richard Runciman Terry, Old Christmas Carols. Part One. (London: Burns Oates & Washbourne Limited, n.d., ca. 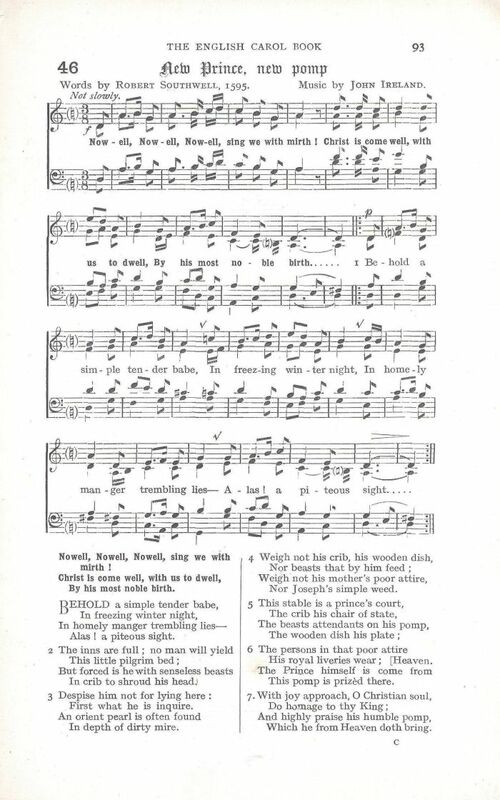 1923), #5, p. 8. Robert Southwell, the writer of the following poem, is chiefly remembered on account of his unfortunate fate. He was educated for the Catholic priesthood, and when young became a member of the Society of Jesus at Rome. After a time, he returned to his own country in the character of a missionary. But he found the government adverse to his Order. For eight years he managed to escape the particular notice of the authorities, but at length he was arrested, and thrown into prison, where he endured the torture of the rack ten times. Eventually he was executed at Tyburn, February 21, 1595. Links open in an external site, The Catholic Encyclopedia. Note: Hugh Keyte, an editor of The New Oxford Book of Carols (Oxford: Oxford University Press, 1992) believes that "Joshua Sylvestre" is a pseudonym for a collaboration between William Sandys (1792-1874) and William Henry Husk (1814-1887). See Appendix 4. 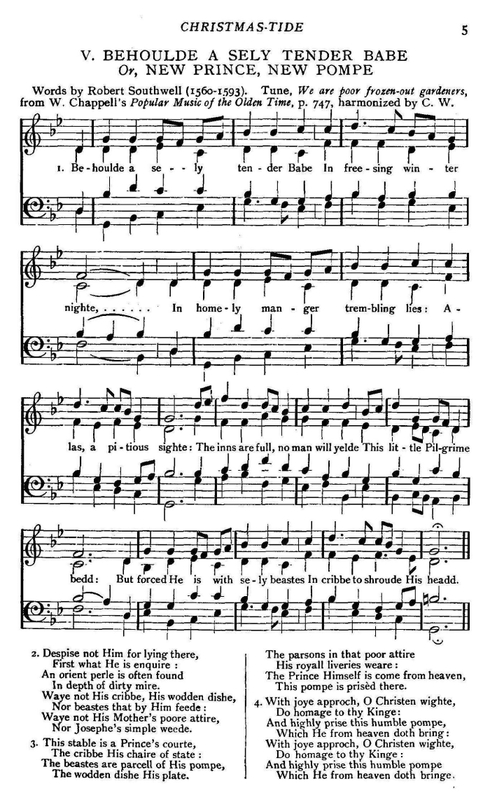 Also found in Edith Rickert, Ancient English Christmas Carols: 1400-1700 (London: Chatto & Windus, 1914), p. 271. Also found in Christmas: Its Origin, Celebration and Significance as Related in Prose and Verse - Robert Haven Schauffler (1907). Also found in Alexander Balloch Grossart, ed., The Complete Poems of Robert Southwell: For the First Time Fully Collected and Collated with the Original and Early Editions and Mss. (Printed for Private Circulation in London: Robbon and Sons, Printers, 1872), pp. 107-108. Reprinted as Volume 30 of Fuller Worthies' Library. In cribb to shroude His headd. The wodden dishe His plate. This pompe is prised there. With joy approch, O Christian wighte! Which He from heaven doth bringe. Line 9, 1596 reads ' Despise Him not:' line 24, Turnbull misprints 'praised' for 'prized:' line 27, Turnbull, after 1630 and 1634, misprints 'praise' for 'prise.' I read 'His' for 'this;' a frequent misprint. The reference to "Turnbull" is to William B. Turnbull, ed., The Poetical Works of the Rev. Robert Southwell, Now First Completely Edited (London: John Russell Smith, 1856), pp. 98-99. Nowell, Nowell, Nowell, sing we with mirth! This pomp is praisèd there. "Southwell’s longest poem, “St. Peter’s Complaint,” is smoothly written, but tedious. After three years’ close imprisonment in the Tower, Southwell was executed at Tyburn, on February 22, 5594—5, at the age of thirty-four or thirty-five. Though he was found guilty of treasonable practices, his sole offence was that he had been a zealous priest of the Church of Rome. He appears to have been a man of noble character, humble and gentle and intrepid. [In the last line of the penultimate stanza of “New Prince, New Pomp,” the word praisèd should be prizèd. I quoted from an inaccurate reprint.]" 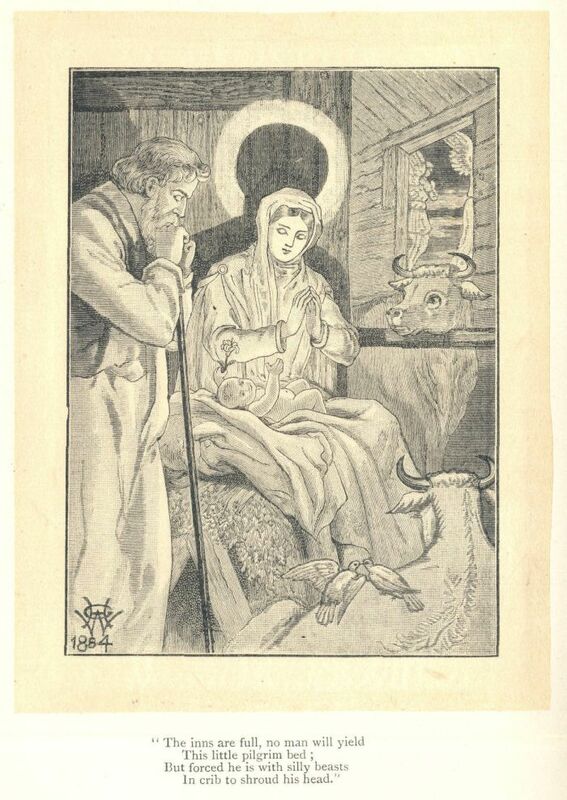 Bullen reproduced this illustration by Henry G. Wells, inspired by a portion of the first verse. Editor's Note: The following note is from William Chappell, The Ballad Literature and Popular Music of the Olden Time. London: Chappell & Co., 1859, pp. 747-8 concerning the tune "We Are Poor Frozen Out Gardeners." All of these can be found in The Complete Poems of Robert Southwell (1872), available at both Google Books and, in multiple formats, the Internet Archive.